So…my jeans always wear holes in the crotch area. Every time. *sigh* They look like new everywhere else, but the spot where my thighs rub together when I walk rips and frays after a lot of wear. So annoying. I know I’m not alone because my sister experiences the same problem and I suspect loads of you out there have too! You can fix it though – my technique is super simple and a little bit rough, but it works for me and I’ve used this method on several pairs with great success. 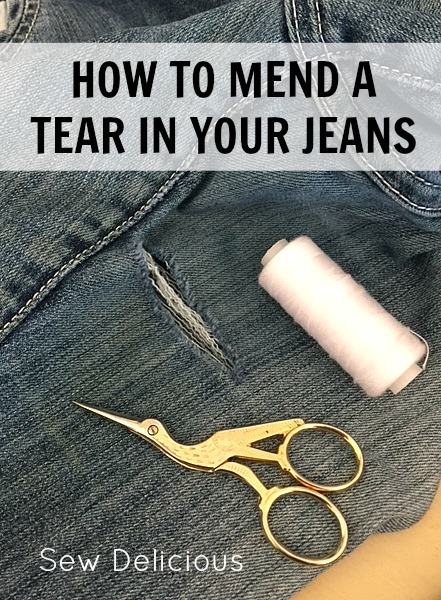 Yes I am aware of the irony that I recently wrote about how I refuse to mend and here I am posting a mending tutorial…but I hate shopping for jeans more than I hate mending and this is a quick 15 minute job. You need: Your sewing machine, coordinating thread, a small scrap of neutral coloured cotton or coordinating denim. 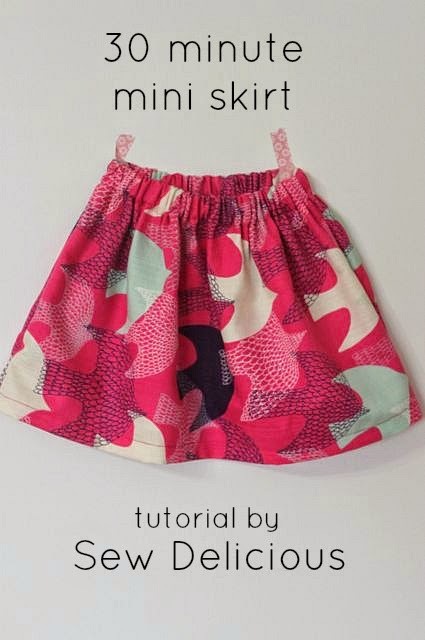 Trim your scrap to size so it fits over the top of the tear with extra fabric around all sides. Secure with a couple of small pins if you need to. Stitch the cotton patch over the top of the tear. Stitch one end to the other, pivot and sew a few stitches, then pivot again and go all the way back along the tear. Repeat LOADS of times (25-40 times) to ensure the tear and the frayed edges are all secure under the lines of stitching. 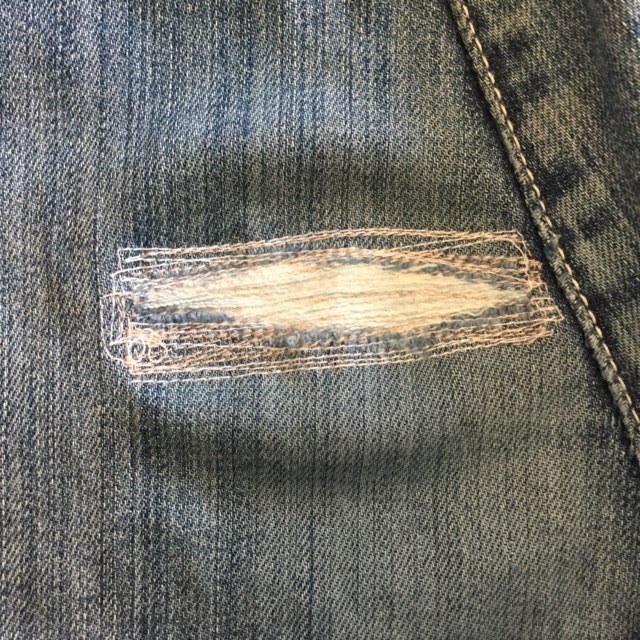 Turn your jeans back in the right way and look at your repair. Make sure it feels secure and reinforces all the frayed edges. Trim any excess fabric from the cotton patch. I use pinking shears to minimise fray. Is it a pretty repair job? Not at all. But the stitching gives the worn fabric additional strength so it will last. Being located at the crotch or inner thigh means that no one will see the repair when you are wearing them. 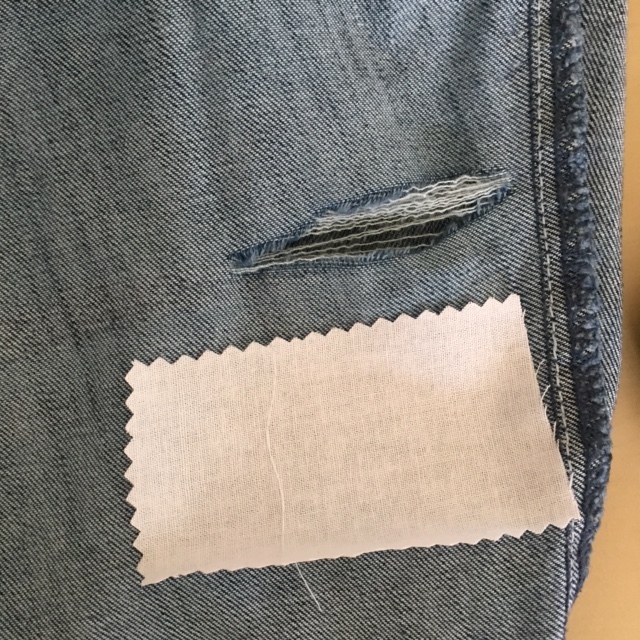 I’ve also fixed fabric tears in corduroy using this method. I hope this tutorial helps you save your favourite pair of jeans! Yep, zig zag stitch works great too! I’m the same – when I find a pair I like, I hang on to them for years! It’s my left knee that always gives out first on my jeans, never the right or anywhere else. Like your method but not sure about trying it out on my knee, although in this day and age it could start a trend! You never know! Use brightly coloured thread! Great idea and yep sooooooo annoying! I’m really in to mending on a practical level but also have been eyeing off some beautifully decorated style of mending. 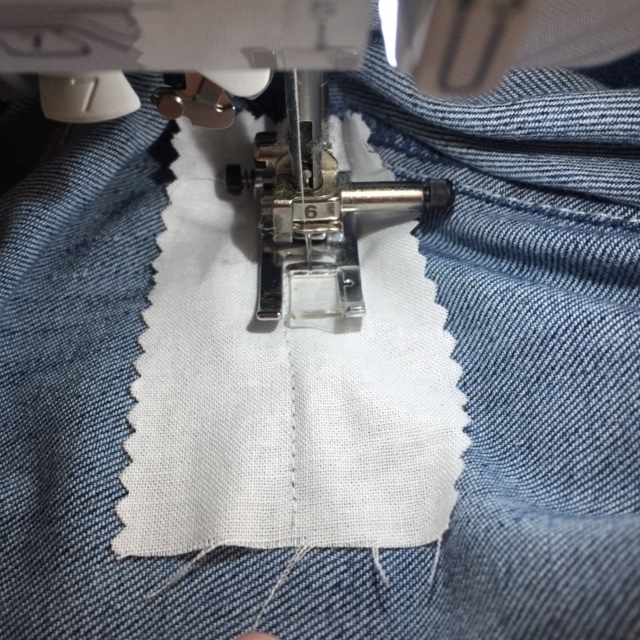 With my son’s skinny jeans I can’t fit the leg in my machine so I have to hand sew but I’d rather just quickly do it with my machine. I always rip out the side seam of legs so I can fit it in my machine then sew it back up when I’m done. 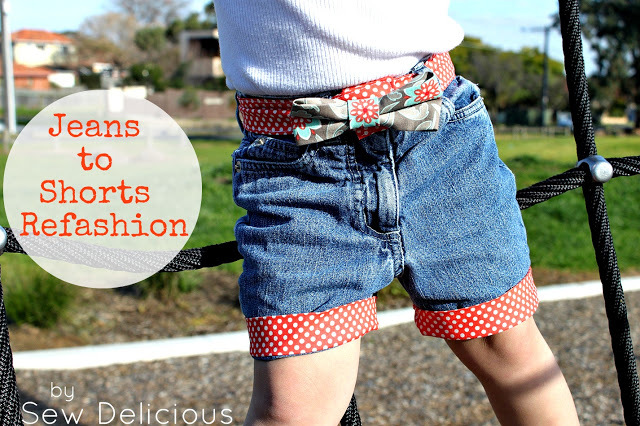 Great tip – that would also be extremely helpful for kids trousers! Perhaps a fun hand sewn patch would work for his jeans! I do the same thing with mine and it always works a treat. I check my jeans after every wash and if they look like they are starting to weaken at that point I do some pre-emptive mending in the same way to strengthen them. I find if I use flannel scraps on the inside the softness of the flannel sort of buries the stitching which can sometimes feel a bit rough on the leg otherwise. I also use bondaweb to fix the flannel in place before I sew. Using flannel is a great idea! When your jeans really get to the point where a repair is no longer an option don’t toss them, cut them up and make a quilt out of them. Look on pinterest, there are so many patterns there. In fact I would love to see some kind of quilt along??? Ideas??? I’ve done this for a ‘brick wall’ quilt that I haven’t finished yet. My jeans always wear there too. It is the worst when you do something like sit on he floor to change a nappy and lean forward and hear “riiiiiiip”! pooh yes that has certainly happened to me!! My boyfriend’s mum recently fixed his jeans using similar technique but she used blue thread so I just looked part of the jeans haha.